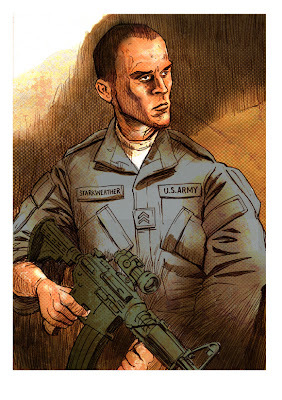 Colour rough character design for a spin-off from the zombie horror novel SIX I illustrated earlier in the year. Author Ryan Henry has been working on a novella that takes place in the same continuity and this time focuses on two more survivors. Still beset by a multitude of technical problems, and STILL haven't moved house. The latest clusterf*ck involves my wacom's pressure sensitivity refusing to work despite spending hours looking for drivers and restarting and restarting the PC. Anyway, this is the best I can do at the moment really.